A. The maximum allowable sign height is indicated in the freestanding signs table below. In those instances where the roadway is depressed below or elevated above the adjacent property, adjustments in the allowed maximum height may be allowed by the City Planner in accordance with this section. 1. The maximum height of a freestanding sign is measured from the elevation of the centerline of the adjacent roadway to the top of the frame or sign structure, whichever is tallest. Refer to the freestanding signs table below and the illustration above. 2. 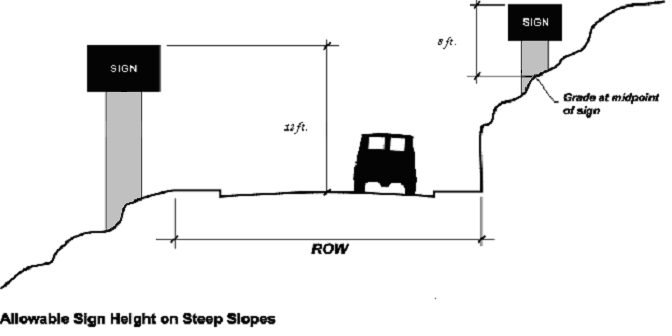 If the side slope of the property perpendicular to the street right-of-way is so steep that it does not allow the construction of a six (6) foot tall sign within the maximum allowable height limit, the City Planner may allow the sign to extend eight (8) feet above the grade. Refer to the freestanding signs table and the illustration below. B. A freestanding sign may have two (2) faces. If the two (2) faces are located in such relationship to each other that both cannot be viewed from any point at the same time, only one (1) face will be counted in totaling the number of signs or sign area. D. In the freestanding signs table above, “light” and “dark” refer to the amount of light reflected by a color. A dark color reflects less light than a light color. The City Planner shall have the authority to interpret the lightness of lettering/logos and other graphics relative to the lightness of the sign background. E. Sign Base. Freestanding signs must have a substantial base with a length of at least one-third (1/3) the maximum length of the sign at its maximum cross section as illustrated above. 1. Any portion of a freestanding sign must maintain a six (6) foot minimum setback from the public right-of-way and a five (5) foot minimum setback from any property line. 2. 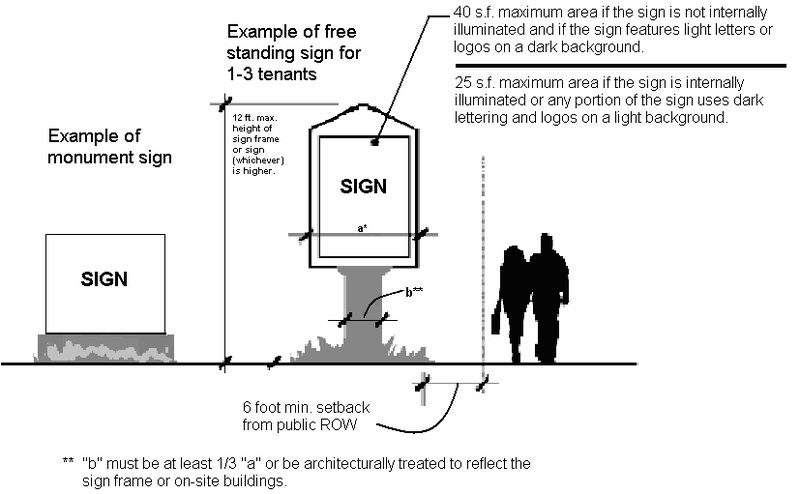 Freestanding signs shall meet the sight distance requirements of the City of Snohomish Public Works Standards. G. Number Per Site and Minimum Spacing. 1. One (1) freestanding sign per site is allowed, except that a business with frontage on a City street and a state highway, where the building is not visible from the highway, may have an additional freestanding sign facing the highway; provided, that the sign shall not exceed eighteen (18) feet in height as measured from pre‑existing grade or finished grade of the sign location and shall not exceed fifty (50) square feet in area. 2. Sites fronting on two (2) streets may have one (1) freestanding sign per street; provided, that these signs are at least one hundred fifty (150) feet apart as measured along the property lines. H. Landscaping. A defined landscaped area shall be provided at least two (2) feet around the base of the freestanding sign to make the base of the sign and any ground-based lighting more attractive and deter vehicles, shopping carts, and people from contacting the base of the sign. The landscaping shall consist of a combination of ground cover materials and low-growing shrubs.